Cullen Family scholarship recipient is working toward a career in horticulture therapy. A look at how families are passing on the the tradition and love of gardening to the next generation. 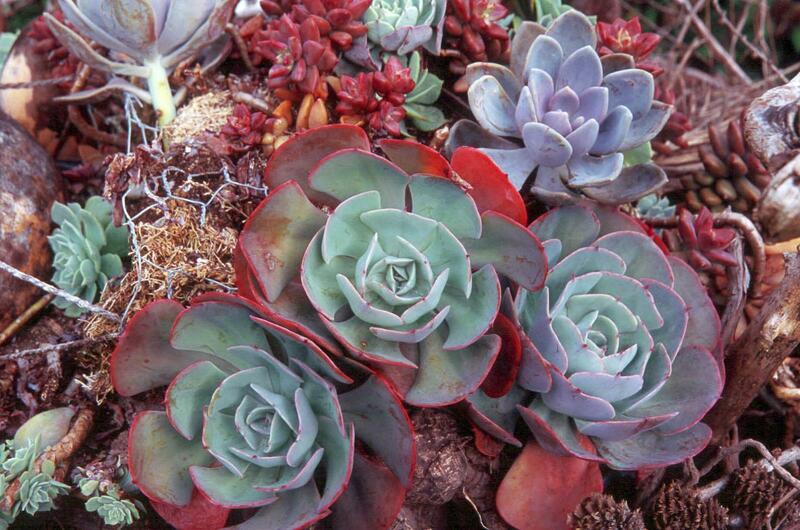 Echeveria and succulent display in Emily Gadonyi's garden. Progressive teaching at the Niagara Parks Commission School of Horticulture results in captivating garden design, as students add good taste, literally, to the other classic design principles of colour, form and texture. Part of my late summer ritual includes a trip to the Niagara Parks Botanical Garden and School of Horticulture to explore and photograph the vegetable plots designed by the second year students. According to Liz Klose, superintendent of the School, the program combines both theoretical and practical components. This philosophy is put into practice with an assignment to create vegetable plots. Students are encouraged to express their individual creativeness while demonstrating the efficient use of space and effective growing techniques. Sponsors such as Stokes Seeds, Ontario Seed Co. and Ball Seed Co. provide seed to the students, who trial their choice of vegetables, flowers and herbs and then report their findings at the end of the growing season. The project is worth 25 percent of their final mark for the course. "The students can embellish their plots with extra plants, supports and walkways. They are encouraged to express their individual creativeness," says Klose. Their creativity showed on my visits to the project over the past several years. Each bed is unique, with the students offering an interesting collection of ideas from growth techniques and innovative use of plants to unique, often thought-provoking, structures. Gardeners of all ages and skill levels will find something to appreciate in these vegetable gardens. The ship theme was the re-creation of a childhood dream, according to Ben Willis. Cabbage and kale were used to represent water in this nautical-themed garden. A whimsical garden seat made of recycled birch logs makes an interesting focal point. A cottage garden of vegetables and herbs designed by Eric Wright captivated everyone's attention. Let me introduce you to Rebecca Murphy, who spoke to me in 2003 as a second year student. "My garden was composed of different vegetables, including Brussel sprouts, Swiss chard, lettuces and tomatoes. The garden is divided by a wooden planking walk and wooden posts for a unique vertical appearance. Each post is connected above by wire in the hopes that vine crops would climb the wires. Tropical plants such as avocado, mango and fig were emphasized." Murphy wanted to demonstrate, "the effectiveness of different mulches while maintaining a good aesthetic." Her trials included sheet mulching composed of layered newspaper and cardboard, which is used in permaculture (a school of sustainable, energy efficient, ecologically sound gardening), versus leaf mould and wood mulch. Murphy enjoyed the project: "It offered room for creativity and independent learning." And what would she have done differently, if given a chance to start again? "I would start earlier and use more diverse vegetables, such as Asian varieties. It would have been nice to have more time to dedicate to this project, I wish I could do it again." Klose suggests a visit to the student vegetable plots should encourage the public to be more adventurous with their gardens, including the use of vertical interest. The gardens should entice gardeners to be as creative with their vegetable plots as they are in the landscape. "Don't forget the importance of texture, colour and form when planning a vegetable garden," Klose noted. This program offers many lessons for home gardeners and professionals alike. Why not try something new? Analyze what works and why. Be adventurous. The students are encouraged to express their creativity while demonstrating efficient use of space and effective growing techniques. A creative hand was very evident in a 2004 project, where the skeleton of a sailing ship became the structural base for a garden. The ship theme was the re-creation of a childhood dream, according to Ben Willis. "I've liked ships since I was a child so the idea came naturally to me. It was a lot of fun creating a childhood dream." Found materials were used to assemble the hull of a ship that served as an enclosure for a lush vegetable garden. A tall post represented the mast with plastic netting serving as a large scale sail. Steel blue kale and cabbages planted around the edge of the ship gave the impression of turbulent seas. "It was difficult to find things to climb up the mast. I tried peas, tomatoes and morning glories. In the end, gourds were the only thing that worked," said Willis. Melanie Sifton enjoyed plants that were aesthetically pleasing and useful for eating. Towering above the back of her plot were three bamboo tepees to support massive vines of the loofa gourd. Seeds sown in the greenhouse in the late winter bore zucchini-shaped gourds by late summer. These were later dried to use as loofa sponges. The students must weigh and document all of the crops as they are harvested. Sifton harvested 3 lbs. of leaves from her patch of 24 Genovese basil plants, eventually processed into her favourite pesto sauce. Emily Gadanyi chose a 'bird' theme based on her experience working in an aviary. Her selections included Amaranthus 'Golden Giant' (which birds love), eggplant and Dark Opal basil in a garden centered around a nest-like sculpture planted with succulents such as Echeveria. She used mothballs to help deter pests. "Having your own little plot of land, having complete control over it and being able to try different methods," were the benefits of the project noted by Josh McMeekin. His choices included ornamental corn and tomatoes. The corn was started in peat pots in the greenhouse three months before they were planted out. By August, they towered over the heads of visitors to the garden. His vegetable plot included a pond with a stone surround. "Native untouched landscapes have always appealed to me." McMeekin advised, "Keep it simple! Interplant and find companion plants for different veggies, it really worked for me." Many of the gardens enjoyed a 'home' based theme, featuring the vegetables and plants that had been grown at the student's home. Laura Wallis grew, "things my family liked to can, such as dill pickles, or comfort foods such as popcorn, squash and watermelon." Wallis planted marigolds around the path keep pests away and grew 'Icebox' watermelons vertically for space efficiency. The rabbits presented quite a problem, "I had to sow my beans three times. I just figured they needed my beans more than I did." Her philosophical attitude bears remembering the next time the rabbits are eating your favourite seedlings. In the final analysis, it is very heart warming to hear students like Shelley Frank of Thunder Bay, Ont. note, "I learned a lot. I have never grown vegetables before so this was a great experience." At the furthest corner of the 2004 student gardens, you could open the picket gate and stroll along an S-shaped woodchip path lined with cheerful marigolds. At the end of the path stood a rustic shed with a covered veranda. Symmetrical four-pane glass windows and a planter filled with cheery blooms decorated the front of the facade. Two rocking chairs completed the illusion of a cosy front porch. Eric Wright's cottage garden was filled with vegetables and herbs and featured a privacy screen of tall corn and flowering tobacco along the perimeter. This fantasy garden setting was picture perfect. The structure resembled the set of a Hollywood movie, and certainly drew its share of attention. The students are to be commended, by designing their vegetable plots with such freedom of imagination, these young gardeners show us how creativity can breathe life into the most humble of plantings, our vegetable patch. Theresa M. Forte is a garden consultant, columnist and photographer based in the Niagara Falls, Ont.